Arton Review is a project by the Arton Foundation in Warsaw in which Polish artists of the younger generation create film works inspired by the classics of Polish experimental filmmaking and video art. The programme within KINOTEKA features works commissioned by Arton to date, such as Telepathy by Łukasz Jastrubczak, The Line by Agnieszka Lasota and ID by Karol Radziszewski, amongst others. Adding context to these latest productions is a presentation of the seminal film and video works created by outstanding Polish avant-garde artists in the 1970s: Wojciech Bruszewski, Paweł Kwiek and more. Accompanied by a discussion on inter-generational artistic collaborations, the event features artists in attendance Paweł Kwiek, Agnieszka Lasota, Karol Radziszewski, and Ryszard Waśko, as well as curators Łukasz Mojsak and Marika Kuźmicz. In association with the Polish Cultural Institute and Kinoteka Polish Film Festival. The event features two film screenings followed by panel discussions with artists and a Q&A session. The first screening is an introduction to the work of artists participating in the Arton Review programme of commissions and spans four decades of Polish experimental filmmaking and video art – from seminal structural experimentation from the circle of the Workshop of the Film Form to works by recognised artists of the younger generations from the later periods. The second screening is a presentation of works commissioned within the Arton Review programme as well as the films that inspired them. Marika Kuźmicz is a graduate in art history from the University of Warsaw, PhD at the Institute of Art, Polish Academy of Sciences in Warsaw. She conducts research on Polish art of the 1970s. Head of the Arton Foundation in Warsaw, a non-profit organisation active in the field of research and exhibitions of Polish art of the 1970s. Curator of contemporary art exhibitions, such as Conceptualism. Photographic Medium (Łódź, Poland, 2010), Conceptual Photography from Poland (Berlin, 2011), Doing the Impossible Light (in cooperation with Florian Zeyfang, Warsaw, 2015) and many others. Co-author and co-editor books devoted to the Polish art of the 1970s. Lecturer at the University of Warsaw. Łukasz Mojsak is a graduate in art history from the University of Warsaw, graduate student on MA Contemporary Art Theory at Goldsmiths, University of London. In 2011–2016 worked at the Museum of Modern Art in Warsaw focussing mainly on research and propagation of artists’ moving image. Long-term collaborator of the Arton Foundation in Warsaw. Curator of film screenings, art projects and exhibitions, such as Propaganda Projector (Gdynia, Poland, 2013), Across Realities. Films by Wojciech Bruszewski (London, 2013), Wojciech Bąkowski’s Profile screening at Internationale Kurzfilmtage Oberhausen in 2014, Out of the Black Room (co-curator, Katowice, Poland, 2015), Ludmiła Popiel (Warsaw, 2016), Communis – Renegotiating Community (co-curator, Lublin, Poland, 2016). Translator of books and texts on art. Arton Review is a project by the Arton Foundation in Warsaw in which Polish artists of the younger generation create film works inspired by the classics of Polish experimental filmmaking and video art. The programme within the KINOTEKA Polish Film Festival features works commissioned by Arton to date. Adding context to those latest productions is a presentation of the seminal film and video works created by outstanding Polish avant-garde artists in the 1970s: Wojciech Bruszewski, Paweł Kwiek, Jolanta Marcolla, Ryszard Waśko, as well as younger generation artists participating in the Arton Review project. Accompanied by a discussion on intergenerational artistic collaborations, the event features artists in attendance: Paweł Kwiek, Agnieszka Lasota, Karol Radziszewski. Piotr Bosacki’s film Cardboard Boxes (2014) is the artist’s own take on Bruszewski’s analytical artistic practice. In Bosacki’s film, a camera installed on a remote control toy car moves inside a structure made of cardboard boxes. Unable to see the vehicle hidden inside, the operator determines the position of the camera on the basis of the sound. Hitting against the walls, the car destroys them in order to move from one box to another box. Thus, the camera has a direct impact on the structure of the cardboard sculpture. Piotr Bosacki (b. 1977) is a visual artist, musician and composer working mainly in the field of animated films, which often adopt the form of closed systems that allow for an analysis of their structural configurations. The programme also includes Bosacki’s film Obvious Things (2013). Wojciech Bruszewski (1947–2009) was one of the pioneers of Polish video art, sound art, and the use of computer technology in art. In the 1970s, he co-founded and was one of the mainstays of the Film Form Workshop, the most important Polish experimental cinema group. The programme includes excerpts from the collected body of Bruszewski’s film experiments Ten Works (1973–1977), in which the artist focusses on investigating the relations between reality and perception as mediated through technology. Henryk Gajewski (b. 1948) is an artist active in many fields, such as photography, film, performance, happening, mail art, audio art, video art, Internet. His work has been exhibited at major international museums. Participant of Documenta 6 in Kassel. Creator of I am – International Artists’ Meeting in 1978 – the first international performance art festival in Eastern Europe. Author of the first artistic Internet action in Poland in 1995. Gajewski’s work is represented by his film Identity (1985), where the artist analyses the mechanisms of constructing cultural identity. Underpinned by his own biography, the film taps into the formal potential offered by video technology to illustrate the discussed topic. Łukasz Jastrubczak (b. 1984) is an artist working with different media, such as video, sculpture, installation, concert, intervention, journey, ephemeral occurrence. Awarded the prize “Views – Deutsche Bank Award” in 2013. Another work by Jastrubczak featured in the programme is The Perspective of Failure (2013). Paweł Kwiek (b. 1951) was a co-founder and member of the Workshop of the Film Form. A pioneer of video art in Poland, Kwiek works in the fields of experimental film, video, photography and drawing, engaging with the disciplines of philosophy, cybernetics, poetry and sociology. His works in the programme include Video A. Studio Situation (1974), which is a record of the artist’s performance broadcast live from the studio of the Polish Television. His action consisted in providing camera operators and producers with guidelines as to framing, choice of the current camera and changing the takes. Thus, Kwiek demonstrated to thousands of viewers that any attempt at reporting a given event is necessarily selective, fragmentary and distorted. The later period of Kwiek’s work is represented by Conversation with God (1990). In the 1980s, after the artist’s spiritual revelation, Kwiek engaged in a religious art practice. The video re-enacts a mystical situation of his communication with God. Conversation with God became the starting point for Kwiek’s collaboration with Łukasz Jastrubczak. The latter’s work Telepathy (2014) documents an event which took place at the beginning of October 2014 on the outskirts of Warsaw. During a car journey Paweł Kwiek and Łukasz Jastrubczak attempted to communicate by means of telepathy. Agnieszka Lasota (b. 1971) works on the border of design and new media, engaging with a complex analysis of the contemporary consumer society. The central theme of her work are social relations in the rapidly changing world as well as investigation of ties in newly emerging society. Featured in the programme, Agnieszka Lasota’s film The Line (2017) was created within the Arton Review programme and draws inspiration from the work of Barbara Kozłowska (1940–2008). Kozłowska participated in the breakthrough events of Polish Conceptual Art of the 1970s. Still, she was a well-known and an unknown figure at the same time, which might result from the fact that her art often relied on ephemeral, hardly perceptible and disinterested gestures – performances and ephemeral interventions in space. Since 1970, she pursued the project “Borderline”, within which the artist made journeys across the globe. Lasota’s film draws inspiration from the Kozłowskas openness to ephemeral art, which manifested itself not only through artistic activity, but also consisted in intentional “being there.” Kozłowska once said: “Journey is the road to art,” while Lasota’s film is a work that attempts to put that postulate into practice. Jolanta Marcolla (b. 1950) was the first woman artist to work with video art in Poland in the 1970s and became a major experimenter in the field of photography and film. Co-founder of the artistic group “Gallery of Current Art,” which participated in numerous major art events in Poland and worldwide between 1972 and 1975. Marcolla’s film Kiss (1975) is based on a repetitive scene in which the artist sends out a kiss to the viewers. Highlighting the mechanic character of the medium of film, the work imbues a cold analytical loop with a human touch. In Forced Response (1976), the artist goes out to the crowded city streets with a camera operator to confront passers-by with the camera and provoke their reactions, thus shaking them out of the fast-paced rhythm of urban everyday life. Karol Radziszewski (b. 1980) works with film, photography, installations and creates interdisciplinary projects. His archive-based methodology spans across multiple cultural, historical, religious, social and gender references. Since 2005, he has been publisher and editor-in-chief of DIK Fagazine, and is the founder of Queer Archives. Within Arton Review, Karol Radziszewski created the film ID (2016), drawing on the work Identity (1985) by Henryk Gajewski (b. 1948), in which the artist – Radziszewski’s uncle – analysed the mechanisms of constructing cultural identity. During an artistic residency in Sao Paulo, Radziszewski tapped into his experience of temporary emigration and analysed his situation by using chapters-keywords – the same that were used by his uncle in his video from 1985. The programme also includes Radziszewski’s work Ready 2 Die (2009), record of a video-performance from Muzeum Sztuki in Łódź, addressing in an ironic and polemical way the conventions and strategies used by artists whose performances are documented in the museum’s experimental video collection. Ryszard Waśko (b. 1947) is an artist working with photography, film, video, drawing, painting, sculpture, installations and performance. Waśko studied at the Film School in Łódź, where he was a major member of the seminal artists’ group Workshop of the Film Form. In the 1980s, organiser of international exhibitions Construction In Process in Łódź; in the 1990s, founder and curator of the globally active Museum of Artists. Art director of the MoMa PS 1 in New York in 1990–1992. Waśko was one of the most prominent artists to engage in analytical and structural film practice in 1970s Poland. Featured in the programme, his film 30 Sound Situations (1976) focusses on the relations between sound and space in film, while at the same time manifesting human presence “here and now,” thus introducing the aspect subjectivity into an otherwise heavily analytical practice. 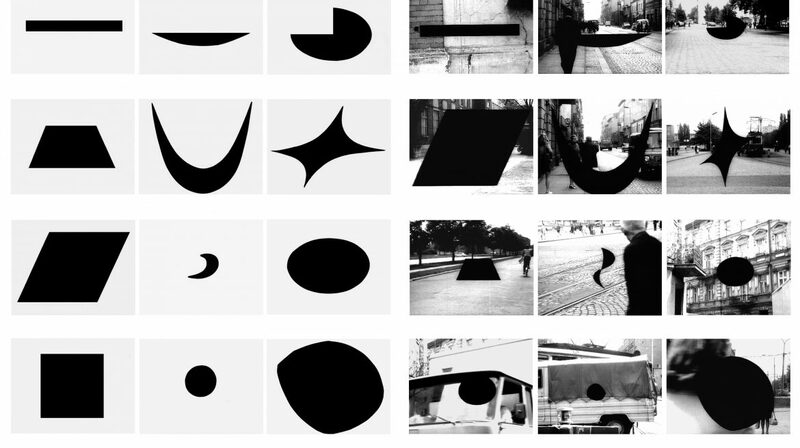 In Straight-Curve (1973) Waśko imposed black geometrical figures on filmed views of a city. Due to such a simple procedure, the film space, hitherto perceived as three-dimensional, suddenly reveals its real two-dimensionality. Thus, Waśko managed to manifest the workings of the mechanism according to which our perception automatically over-interprets flat images that unfold before our eyes. In his Arton Review commission Cruising the Neighbourhood, Thinking (2016), the multimedia artist Łukasz Sosiński (b. 1981) makes a direct, and perhaps humorous, reference to Waśko’s Straight-Curve. Sosiński transposes the methods used by Waśko in the 1970s and shifts them into a different context through the use of new media. Amanda Wieczorek’s (b. 1989) film The False Mirror (2017), within Arton Review, focusses on Jolanta Marcolla’s practice. Her work features a mirrored television arranged in the landscape and paired with a voice (sampled and mixed from the 1960s documentary The Story of Television) that discusses what and how we see. The artist alludes to the fact that, in fact, it is the TV does the seeing, and not our eyes. Born in Detroit and living in Warsaw, Amanda Wieczorek is primarily known for delicate collage work that deconstructs the human form within spaces that exist amidst dreams and the waking life.